There are currently 68,417 users on this website. 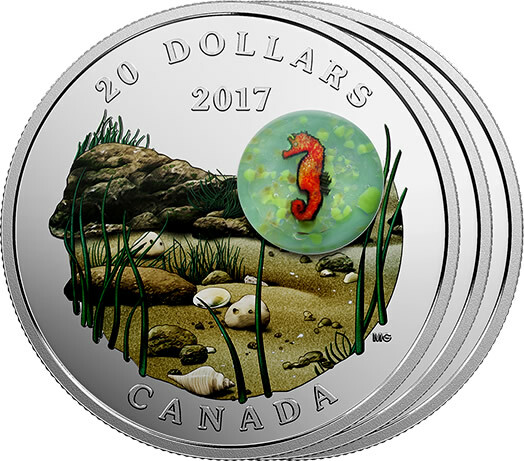 Royal Canadian Mint - About the first coin: Designed by Canadian artist Maurice Gervais, the first coin in the 3-coin subscription offers a glimpse of the hidden underwater world off Canada's Atlantic coast, thanks to its depiction of a shallow sea grass habitat. The application of vivid coloured enamel over the detailed engraving recreates the textured rocks, seashells and swaying green grasses that line the sandy ocean floor. To the right, a handcrafted glass embellishment by Canadian glass artist Loïc Beaumont-Tremblay contains a striking seahorse-shaped mosaic murrini element. The mosaic-based approach to this glass art technique lends itself well to recreating the seahorse's speckled colouring, while other features such as its bony armour, pointed snout and curled tail are equally captured in extraordinary detail. The murrini piece has its own protection thanks to its resilient glass enclosure sculpted from borosilicate glass.